How we communicate our science to the scientific community. Our many publications funded by P41 RR015241 and P41 EB015909 can be found in this search on PubMed (embedded below). Peter Barker, Xavier Golay, Greg Zaharchuk. 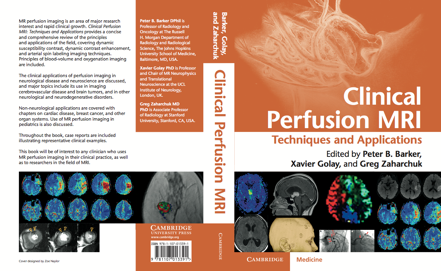 Clinical Perfusion MRI: Techniques and Applications. Cambridge University Press, 2013. ISBN-10: 1107013399; ISBN-13: 978-1107013391. Susumu Mori. Introduction to Diffusion Tensor Imaging, Elsevier, B.V., Amsterdam, 2007. ISBN-10: 0444528288. PB Barker. "Diagnosis and Characterization of Brain Tumors: MR Spectroscopic Imaging" in Functional Imaging of Brain Tumors, ed. Jay Pillai. Springer, 2013. PB Barker. "Ultra-High Field MRSI (7T and Beyond" in Functional Imaging of Brain Tumors, ed. Jay Pillai. Springer, 2013. J Zhou J, PC van Zijl. Chemical exchange saturation transfer imaging and spectroscopy. Progr NMR Spectr 2006;48:109-136. PB Barker, DD Lin. In vivo proton MR spectroscopy of the human brain. Prog NMR Spect 2006;49:99-128. DD Lin, PB Barker. Neuroimaging of phakomatoses. Semin Pediatr Neurol 2006;13(1):48-62. S Mori, PCM van Zijl. "MR Tractography using Diffusion Tensor MR Imaging", in "Clinical MR Neuroimaging: Diffusion, Perfusion and Spectroscopy", Eds. J Gillard, A Waldman, PB Barker. X. Golay, Hanzhang C. Lu, Peter C. M. vanZijl "Methods for Multiple Acquisitions with Global Inversion Cycling for Vascular Space Occupancy" Pub. # US 7,071,689, Jul 4, 2006. P.C.M. van Zijl, H. Lu, X. Golay, "MRI method to detect changes in microvascular blood volume". Pub. # US20050215881, Sept. 29, 2005.